Governors of the nineteen northern States have jointly signed a memorandum of understanding with General Electric, Nigeria, (a billionaire American multi-national corporation) for the upgrade of healthcare infrastructures across the three geo-political zones that make up the old northern region. 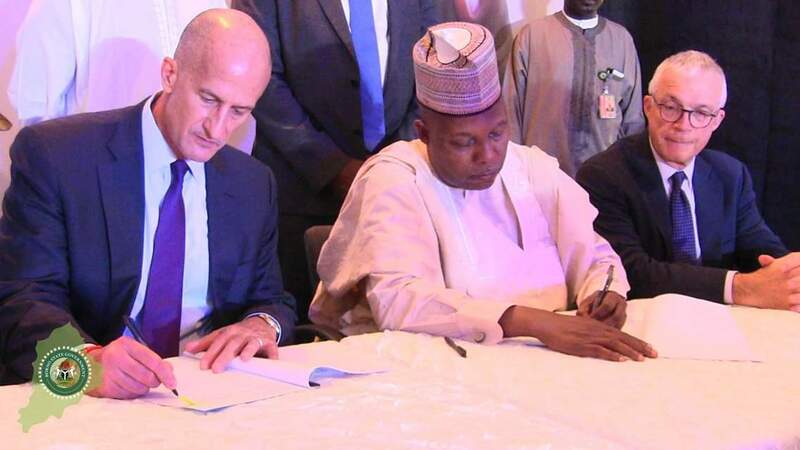 Chairman of the Northern States Governors Forum and Governor of Borno State, Kashim Shettima who signed the MOU on behalf of the 19 States challenged the General Electric to produce practical results by next year. ‎‎General Electric was represented by ‎the corporation’s Vice Chairman/President Global Growth, John G ‎Rice‎ ‎and the President, Chief Executive Officer of G‎.E, Dr Lazarus Angbazo during the signing ceremony that took place Monday night at the Shehu Musa Yar’Adua centre in Abuja with Health Commissioners from different Northern States in attendance. The Northern Nigeria Global Economic Re-integration Program (NNGERP) created by the Northern Governors under the chairmanship of former Presidential economic Adviser, Dr Tanimu Yakubu Kurfi, is to work with GE to drive the implementation, on behalf of the Northern Governors. According to five provisions of the MOU, the G.E is to develop ‎specialized hospitals and diagnostic centers of excellence; build the capacity of healthcare professions; ‎‎revitalize primary and referral healthcare to support attainment of universal healthcarecoverages; manage equipment services Projects, including technology, services & maintenance and explore‎‎ local bio-manufacturing solutions, making five pillars, Dr Agbazo, President of GE, Nigeria, explained in his remark. Borno Governor and Chairman of the Northern States Governors’ Forum, Kashim Shettima said while the Governors have confidence in the commitment of G.E, there was the urgent need for results of the MOU in the coming year in order to translate partnership ‘from paper to people’. “‎I will like to emphasize the wish and commitment of the Northern Governors Forum that by next year, our partnership with the G.E should take practical stock of what we should have been able to accomplish. I would wish us to be in any of the Northern States to see what we are to able to improve. I will rule out Borno so as not to be selfish. By being able to showcase a practical difference, we will be translating the covenant of our signatures from the pages to the people. The Northern Governors Forum is absolutely committed to this partnership and we have supreme confidence in our selfless and versatile Malam Tanimu Yakubu Kurfi, who is heading the Northern Nigeria Global Economic Re-integration Programme which is the facilitator of today’s partnership. As we go towards implementation, we should bear in mind that the lives of many people in Northern Nigeria depend on how quickly we are able to continually improve access to quality and affordable healthcare. The North is dealing with five most serious problems; low literacy, poverty, poor healthcare, unproductive population and bad economic position. To borrow from conclusions of one thoroughly researched presentation by former Chairman of the Securities and Exchange Commission, Dr Suleyman Ndanusa, out of 79.6 million Nigerians living in poverty more than fifty million of them, representing about seventy percent live in the 19 States of Northern Nigeria. The result has been lack of affordability for the most basic of healthcare services. Series of report by the World Health Organisation gives records of as high maternal, infant and under five-old mortality in the northern population. I am sure someone here, would naturally ask the question, what are Northern Governors doing to save the situation? From our thorough analysis, we have since resolved to productively invest on sound and measured basic education. We resolved to have strong bias for girl-child education. An educated woman will go for ante natal care rather than paying attention to any untrained traditional birth attendant. An educated woman will not allow herself to be used by any man to pro-create dozens of children without being responsible for their healthcare, their education and without putting food on the table. We are approaching the whole problems through a social scientific approach” Shettima said.